There is something for everyone at these markets so whether you want to watch a chef mastering his craft, grab some free samples or buy some fresh local vegetables, we’re sure we can find a market that fits your needs. Bloomingdale Farmers’ Market – We found that this particular market was affectionately known as BFM among the locals and this market is open on Sundays from 9am through to 1pm and you will find it on R Street between 1st and Florida Avenue. We like this market as it focuses on local produce only and there are some famous Washington restaurants on site during the occasional weekend. You will find fruit, cheese, eggs, breads and preserves at this market. Columbia Heights Farmers Market – For the taco lovers, we have found the place for you and you will find this at Civic Plaza (we do tours in this area) and this market is open 9am-1pm on Saturdays and 4-7.30pm on Wednesdays. This one began back in 2010 and fresh produce is the name of the game with seafood, ice cream and much more on offer here. Eastern Market – You will find this sprawling hub just 7 blocks east of the US Capitol – we can take you there - and the market is actually listed on the National Register of Historic Places. This market is open from Tuesday to Sunday and if you visit you can expect to find a massive range of products on offer from meats, baked goods, pasta and much more. You will also find local artists on Saturdays and Sundays who will show off their skills in pottery, woodwork, and other crafts. 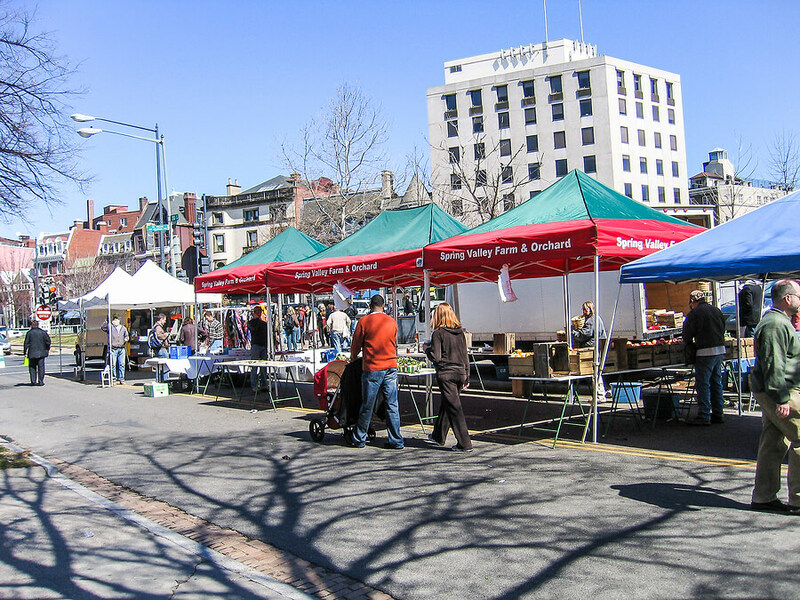 Dupont Circle Market – This market is open all year and is situated in one of the city’s liveliest neighborhoods. During its peak season, there are over 40 regional farmers at this market offering a variety of products with vegetables, fruit, cheese, meat, fish and almost everything else you would expect proudly displayed at this market. We love this one and you will too! Capital Harvest on the Plaza – This is another one where our tours pass by, so you can hop off and visit. It is located near the Ronald Reagan Building and International Trade Center and you will find this one is open from 11-3pm every Friday from spring through fall. There is plenty of fresh produce to be had as well as plenty of recipes for a healthy diet. 14th and U Farmers’ Market – This is located in the heart of one of Washington’s most popular neighborhoods and you can expect to find a variety of vendors showing off their goods every Saturday from 9-1pm. There are massive ranges of flowers and plants as well as plenty of baked goods to enjoy. So there we have it! Six of the best farmers markets in Washington DC! A lot of our tours coincide with many of the market locations so get in touch and we can advise you on how best to get there.